Michael Slotwinski, the artist behind Slots Art Studio, is an honours graduate of the Studio Arts program at the University of Guelph (B.A. 2011). He is also a secondary school visual arts teacher, having earned his educators degree at the University of Western Ontario (B.Ed. 2012). His teaching career has brought him to an academy in England, an international college in Toronto, and his current placement in his hometown of Sarnia, Ontario, Canada. Slotwinski first found success displaying his Hockey’s Masked Men series of iconic NHL goalie mask oil paintings in art galleries, OHL arena’s, and NHL events in 2013 and 2014. With two back to back tours across Ontario, Slotwinski’s art was seen by over 200,000 people, and he has been published in numerous newspapers, magazines, and television programs. 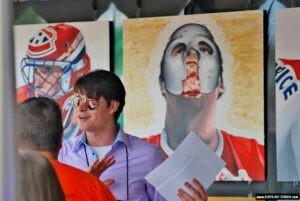 This all culminated with an invite to display his artwork at the 2014 NHL Draft in Philadelphia. Since then, Slotwinski is investing his time on other projects including his One Line Drawings, Focus Art, and Highlighter Art drawings. He is proficient with oil, acrylic and watercolour paints. As well, he is proficient with pencil, charcoal, and ink drawing techniques, and often explores other mediums, too. I have studied, trained, and worked hard to get to where I am today. Education never ends, even after graduation. I am always investing my time in the search of new ways and tools to improve my abilities. I pride myself in my attention to detail and refuse to release artwork that does not satisfy me. Good self-judgement and constructive-criticism allows me to grow and become better at what I do. My goal is not only to create quality artwork, but also to create original ideas. Whether I am working on a portrait or a serial project, the end result will always be a one-of-a-kind treasure that can be enjoyed for many years to come. All of my artwork is traditionally hand-drawn and/or painted using the very best materials for quality affect and preservation. Depending on the project, I draw studies from life, from photographs, and will often spend hours of archival research to get the details and backstory right. My personal projects are my own ideas. I offer you the ability to work with me, to commission me to own a piece of my talent. I also offer prints to share these pieces of art with many who appreciate it the world over. I accept commissions from all over the world and appreciate hearing gratitude from anyone and everyone. Knowing that people enjoy my art, and are willing to invest in the purchase of a piece of artwork not only supports me, but keeps me inspired to keep doing what I love to do.